This card was inspired by one I saw on the Cricut Community Message Board, where I get lots of good ideas. 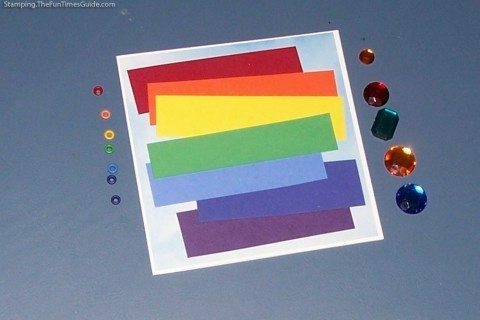 Using my Cricut Expression, I cut this figure from the Accent Essentials cartridge at 1.25 inches in each color of the rainbow: red, orange, yellow, green, blue, indigo, violet. I played around with different ways to arrange the pieces — interlocking them, overlapping them end-to-end, or just laying them on top of one another. I also tried out different background colors. Ultimately, I decided on a 5×5-inch square card made of white cardstock. Then, I used a light blue cloud paper slightly smaller. None of my arrangements worked well on this size card, so I opted to use only 6 figures on the front. I saved the blue piece for the inside. I wanted this card to be a Thank You note, so I cut the words “many thanks” from the Wild Card cartridge. What’s nice about this style of card is how flexible it is. 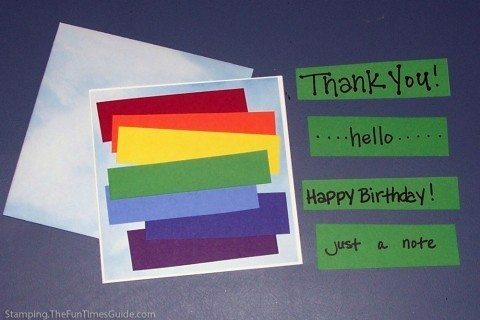 It could just as easily be a birthday card or simple note card. It’s such a flexible card design. The green strip can have words to create any kind of card you need. I realize that not everyone has a Cricut machine, so I wanted to make a version of this card without using one as well. I have a box of small paper scraps (leftover from every project), and this card is just perfect for using them. 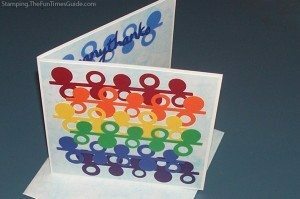 I used the exact same card base (5×5-inch white cardstock and light blue clouds), and I cut random sized scraps in the red, orange, yellow, green, blue, indigo, and violet colors. I’m going to make more like this, and next time I’m going to tear the paper instead of cut it. Another option is to place the colors vertically instead of horizontally. It can also be jazzed up a little using simple embellishments, like stickers, letters, brads, jewels or eyelets.